If you're a Southern California-based emerging designer, then check out this open call from the Los Angeles Fashion Council, the organization that's on a mission to elevate designers through exposure, education and support for talent in their city. 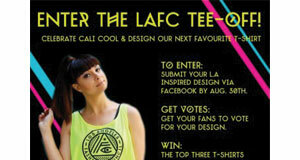 Their Tee-Off contest asks designers to submit their best LA-inspired designs by August 30, via their Facebook app. The audience will vote for their favorite tee and the top three designs will go into production and be sold at the LA Fashion Council's ASOS Marketplace online boutique. Winners will also receive profits made from the sale and their fall 2012 t-shirt collection. Ready to tee-off? Enter the open call at the LA Fashion Council Facebook Page .